Awake fibreoptic-aided intubation is the method of choice to manage an anticipated difficult airway such as the one seen in longstanding goitre with distorted airway anatomy. However the equipment is expensive and a skilled person is required to perform intubation successfully in a difficult airway. Multiple attempts at awake direct laryngoscopy can be complicated by airway trauma, cardiovascular events and aspiration pneumonia. Although the intubating lightwand is an effective and affordable alternate aid to tracheal intubation, it is underutilised. We report an unusual experience where we used a lightwand as a guide to place a bougie which was subsequently used to perform a bougie-assisted awake oral intubation in a patient with distorted airway anatomy. 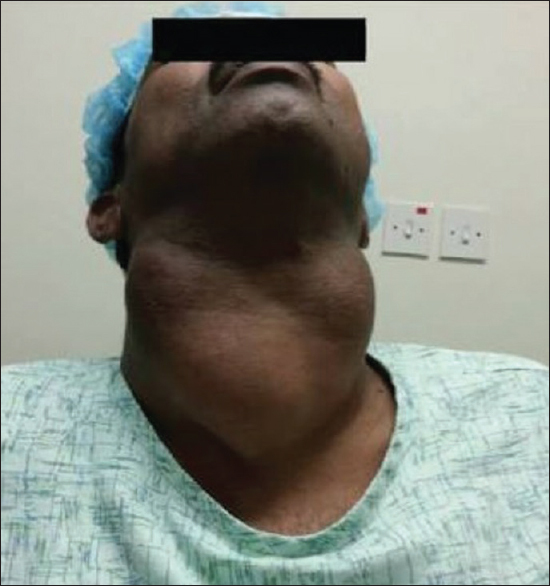 A 34-year-old male presented with a longstanding multinodular goitre with features of hyperthyroidism for 15 years but not on any medical treatment. He complained of dysphagia, dysphonia, hoarseness of voice and stridor both in supine and in sitting positions and was scheduled for total thyroidectomy and modified radical neck dissection. Physical examination revealed a large swelling 10 cm × 15 cm in front of the neck with retrosternal extension (as shown in [Figure 1]), limited Grade 2 neck extension and modified Mallampati Class 3 airway with a mouth opening of 3 cm. Breath-holding time was 10 s with symptoms of airway compromise. 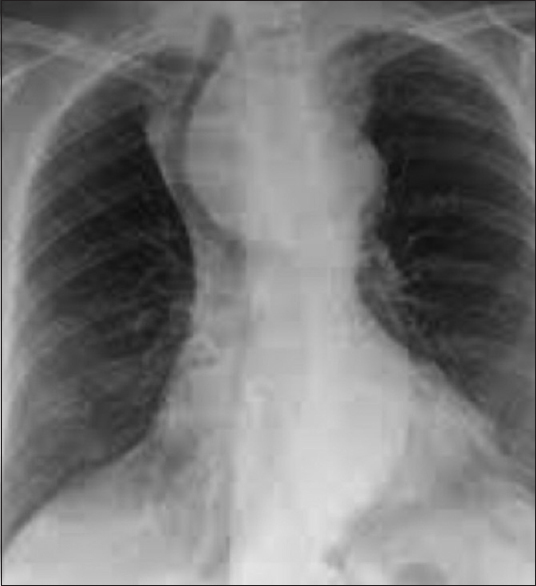 While a chest X-ray revealed tracheal deviation to the right as shown in [Figure 2], computed tomography (CT) scan of the neck showed a large solid mass arising from the left lobe of the thyroid extending into the mediastinum causing tracheal and laryngeal deviation to the right with tracheal compression noted from C6-T1. The mass surrounded the left common carotid artery in addition to causing compression and lateral displacement of the left internal jugular vein. The mass extended superiorly up to the carotid bifurcation with left brachiocephalic vein thrombosis resulting in collaterals over the anterior chest wall. Fine-needle aspiration cytology confirmed anaplastic carcinoma of the thyroid. As tracheostomy was not feasible in view of the distorted anatomy in the neck, we planned an awake oral intubation using lightwand assistance. Transtracheal block was also not possible for the same reason. We secured an intravenous line and administered glycopyrrolate 0.2 mg intravenous, following which topical 2% lignocaine nebulisation was given in the preoperative room. After shifting the patient into operation theatre, we connected 5-lead electrocardiogram, pulse oximetry for monitoring. We also secured radial arterial line for invasive blood pressure monitoring. Oxygen was administered through the nasal cannula at a flow rate of 5 L/min. After ensuring that the difficult airway cart was ready, awake direct laryngoscopy was performed after administering 10% lignocaine spray on posterior pharyngeal wall. It showed a Cormack–Lehane Grade 3b view. We used the lightwand primarily as a guide to locate the tracheal position by its confined transilluminating glow on the right side of the neck. With the lightwand in place, we successfully passed the malleable bougie into the trachea without any hindrance. A cuffed reinforced endotracheal tube (size 8.5 mm ID) was railroaded over the bougie and the tube fixed at 23 cm. Intratracheal location was confirmed using capnography. There was no evidence of endotracheal tube compression noted by ETCO2 curves and airway pressures. We believe that this is an alternative method of using the lightwand for intubation with limited available resources for managing difficult airway. In this scenario, we used the lightwand as a guide to facilitate the placement of a bougie instead of its primary role as a lighted stylette to facilitate the passage of a preloaded endotracheal tube. This unusual experience taught us how a lightwand can be used to aid the passage of a bougie for awake intubation. If this plan would have failed, we thought of using lightwand conventionally for intubation. Following correct tracheal placement, anaesthesia was induced with propofol, fentanyl and skeletal muscle relaxants. Anaesthesia was maintained with sevoflurane in an air–oxygen mixture with supplemental doses of fentanyl and skeletal muscle relaxant administered as needed. Total thyroidectomy was performed uneventfully with the retrosternal portion being removed without the need of a midline sternotomy. The resected specimen was sent for frozen section. After antagonising residual neuromuscular blockade, tracheomalacia was ruled out using the cuff-leak test and the patient extubated over a tube exchanger. Once haemodynamics were stable and airway compromise was ruled out, the tube exchanger was removed. Large thyroid masses with retrosternal extension present potential difficulties for the anaesthesiologist. A distorted airway can deteriorate to become complete airway obstruction with the induction of general anaesthesia. To avoid airway problems during induction of general anesthesia, the anaesthesiologist should perform a careful preoperative evaluation and formulate a plan for airway management well in advance. CT scan of the airway is mandatory not only for assessing the diameter of the trachea at its narrowest portion but also to identify the length of the trachea that is narrowed due to extrinsic compression. The CT scan also helps to evaluate whether the goitre extends to the level of the aortic arch or has caused displacement of major vessels, thereby necessitating median sternotomy. In patients presenting with large goitres with retrosternal extension, awake fibreoptic-aided intubation embodies safe practice. in situations where a fibreoptic scope is not available, the intubating lightwand presents a cost-effective and easy alternative. The lightwand was used as a guide for bougie-assisted awake intubation in this present scenario which is not routinely practiced. Our case management highlights the usefulness of the lightwand in patients with difficult airway and limited airway management options. The lightwand is a valuable, durable, portable, user-friendly, atraumatic, cost-effective option for difficult intubation. Therefore, teaching and practice of lightwand intubation should be encouraged. The lightwand will be particularly useful in hospitals where fibreoptic bronchoscope and videolaryngoscope are not available. In our case, the lightwand was used to facilitate correct intratracheal placement of a bougie over which a reinforced tube was subsequently railroaded. We believe that such an unconventional use of a lightwand should also be kept in mind when managing a difficult airway. The authors certify that they have obtained all appropriate patient consent forms. In the form, the patient has given his consent for his images and other clinical information to be reported in the journal. The patient understands that his name and initials will not be published and due efforts will be made to conceal his identity, but anonymity cannot be guaranteed. Bamgbade OA. The use of intubating lightwand in difficult airway patients with limited management options. Niger Postgrad Med J 2017;24:187-90. Macintosh R, Richards H. Illuminated introducer for endotracheal tubes. Anaesthesia 1957;12:223-5. Ainsworth QP, Howells TH. Transilluminated tracheal intubation. Br J Anaesth 1989;62:494-7.